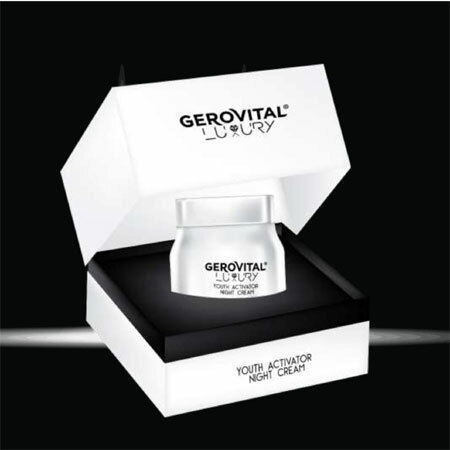 The Gerovital Luxury Youth Activator Night Cream was designed to erase fatigue marks and restore the complexion’s youthful appearance. The cream contains active principles which act in all stages of the dermal reconstruction. Tightenyl™ innovative active lift, acts on the extracellular matrix and improves the skin’s three-dimensional structure. Lakesis, the precious oil extracted from the crystallized resin of Pistacia Lentiscus, reactivates the youth proteins FOXO and Klotho, restarts cellular activity and favor re-densification of the dermis. Niacinamide, Vitamin E and liposomal Vitamin C prevent oxidative reactions and positively influence skin regeneration and wrinkle mitigation. Usage: Apply in the evening on cleansed face neck and decolletage. Apply in the evening on cleansed face neck and decolletage. Massage gently with circular movements to help the cream's better absorption. INGREDIENTS: AQUA, SQUALANE, UNDECANE, DIMETHYL ISOSORBIDE, PENTYLENE GLYCOL, NIACINAMIDE, DIMETHICONE, CETHYL ALCOHOL, GLYCERYL STEARATE, GLYCERIN, TOCOPHERYL ACETATE, DIPALMITOYL HYDROXYPROLINE, TRIDECANE, PHENOXYETHANOL, PEG-75 STEARATE, HYDROXYETHYL ACRYLATE / SODIUM ACRYLOYLDIMETHYL TAURATE COPOLYMER, CERA ALBA , BUTYROSPERMUM PARKII BUTTER, ISOHEXADECANE, MADECASSOSIDE, CETETH 20, STEARETH-20, ASCORBYL TETRAISOPALMITATE, DIMETHICONE CROSSPOLYMER, XANTHAN GUM, PARFUM, TETRASODIUM EDTA, POLYSORBATE 60, TOCOPHEROL, ASIATICOSIDE, DISODIUM ACETYL GLUCOSAMINE, SODIUM GLUCURONATE, CAPRYLIC / CAPRIC TRIGLYCERIDES, DECYLENE GLYCOL, CAPRYLYL GLYCOL, GLUCOSYL CERAMIDE, ADENOSINE, HYDROGENATED PALM GLYCERIDES CITRATE, GLYCINE SOJA OIL, BENZYL SALICYLATE, PISTACIA LENTISCUS GUM, MAGNESIUM SULFATE, SODIUM HYDROXIDE, LIMONENE, LINALOOL, CITRONELLOL.